Why is the ‘Your Life Story’ conversation important? Every one of us has a story to tell and deep down most of us want to know that we, in some way, made a difference in this world. Recalling ‘Your Life Story’ can reacquaint us with our loved ones, and help them to get to know us in new and diverse ways. Taking the time to sit with our family to talk about our life can be a rich and rewarding experience for everyone involved. Recalling memorable events, people, places, favorite activities, successes and disappointments can help bring us closer to the important people in our lives. We can reaffirm to our loved ones how much they have enriched our life. Why is the ‘Your Life Wishes’ conversation important? Every one of us should prepare for the later stages of our lives. It is vitally important to inform other family members of details such as how we wish to be treated should we become fully incapacitated, unable to care for ourselves (or our dependants), what medical treatments we agree/disagree with at the end of life stages, where we wish to spend our final moments (home, nursing home or hospital), and what funeral arrangements we prefer etc. Additionally, it lessens the burden on our families if we document and make known that we have made a Will, various Powers of Attorney (eg Financial, Medical, Guardianship etc), Estate Plan, Advanced Health Care Plan, Insurance Policy, Superannuation, Pre-paid Funeral Arrangements etc. Sitting down with our loved ones to talk about our final wishes can be a rich and satisfying experience for all involved. What is a ‘Heart Will’? While a traditional, legally binding Will bequeaths material goods, a ‘Heart Will’ deals with the non-material. ‘Heart Will’ is a common term used today, but these Wills are also known as Ethical Wills, Love Wills, Spiritual Wills, Legacy Letters, Life Letters and Ending Notes. Heart Wills can be prepared in almost any format, such as a written letter, an audio recording or a video. A Heart Will can share memories, personal stories, values, successes and disappointments, feelings, words of wisdom, hopes and dreams. Some people use their Heart Wills to pass on material goods as well, such as family heirlooms or a treasured piece of jewellery to be gifted to a grandchild on a particular occasion. Keep in mind that a ‘Heart Will’ is not legally binding document like a traditional Will. Make sure that items in your ‘Heart Will’ do not contradict your Legal Will. Think of your ‘Heart Will’ as leaving your words, thoughts and love behind for family and friends, in a way that a Legal Will cannot do. Everyone should have a ‘Heart Will’. It should be kept up to date, and can be shown to family and friends at any time, not necessarily only following death. 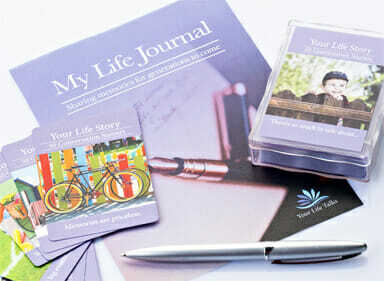 Our ‘Your Life Story’ Conversation Starter cards can be used as a handy guide to preparing a ‘Heart Will’. Who should have these conversations? At various stages of adulthood, we will all have to plan ahead. It may be you are planning for the later stages of your life, or because of major life style changes such as starting a family or travelling overseas for an extended period of time. You can have these conversations with any one person or all of the important people in your life. It doesn’t need to be a formal occasion….you can choose anywhere and anytime that you and your loved ones feel most comfortable to do so. Your conversations can take place at any time during life’s journey – not just at the end of life stages. A good idea is to have a photo album, souvenir, or memento as a prompt to kick-start the conversation. Occasions such as family get-togethers, holidays or simply reminiscing after a dinner can also help someone begin to open up and share their story. You could share a memory about a family holiday, a childhood memory, a favourite song that you recently heard, or some good advice your loved one was given and always followed. “I’d like to write about your life experiences. Will you help me”? “There’s no record of your childhood and early years, and I’d like to talk about them with you”. “Would you like some help putting your affairs in order”? We had a conversation…what happens next? Talking about our life journey and end of life wishes does not have to be a one-time occasion. It can be just the beginning of ongoing conversations during which we can openly discuss a number of things – from reflecting on the past to planning for the future. It is important to take notes during or after your conversations, and record the answers in our free downloadable booklets, ‘My Life Journal’ and ‘Memo of Wishes’. These booklets should be kept with your other important documents. You may also wish to make an audio or video recording of your conversations. Choose whatever approach seems most appropriate and comfortable given the setting of your conversations. These conversations will be helpful in the future, when it’s time to make important decisions about your health care and how you wish to be remembered. However, initiating a conversation to recognize our loved ones’ intrinsic need to remember and celebrate their life and achievements, is the key to understanding why these conversations are extremely important. Family and friends need to understand about all of our lives, and especially how we want to be remembered. Someday, their final tribute to us allows them to begin their personal grief journey. Taking the step to have these important conversations is the most unselfish gift we can give to those we love. Ask yourself this question…”How difficult is it going to be for my family, if I don’t talk to them about my end of life wishes”? It is a universal need for both those being memorialized, and those who are grieving the loss of a loved one, to acknowledge all aspects of celebrating a life. Funeral and Memorial services, burial in a cemetery, storage or scattering of cremated ashes, creating a memorial plaque or monument, and any other means of paying tribute to our loved ones are all considered to be part of the process of memorialisation and are enormously important. Memorials are the first step in the healing process, by providing family members and friends with a caring and supportive environment in which to share thoughts and feelings about the the death of a loved one.